UPDATE: December 24, 2015. His name is Max!! Max was born on September 22. I haven't seen him yet but that will change tomorrow night when Brynn, Philipp, Isabella, Alexander, and Max arrive for Isabella's 8th American Tour. They will be here for 7 weeks. July 1, 2015. It's a BOY!! Elaine will be flying back to Germany on September 21 for the birth of our 4th grandchild, Brynn's third child. Once again I will be staying home since it is just better for all of them if I am not there. I get in the way at these sort of things. March 8, 2015 Update: Elaine, my sister (Brenda), brother-in-law (Joe), and I will be taking a long-awaited trip to Germany on Tuesday, March 10th, to visit Brynn, Philipp, and Isabella & Alexander. We will also be taking a four-day trip to Paris while there. The time difference between CDT and western Europe is 6 hours since they do not change to daylight savings time until after we return. So, noon there is 6AM in middle Tennessee. I look forward to watching a little of the boys' state late at night from Germany! I will be updating the site off and on all day but, as I think you can understand, I will have my priorities elsewhere for the next two weeks. However, I will try to provide as much coverage as possible for the boys' state tournament and for spring sports. I am fortunate enough to have a lot of fans who help out tremendously year-around and they will be around doing all they can these next two weeks. Thanks in advance to them, once again and as always. I will be posting pictures from Europe but, as with every trip over there, I never really know when, or how, or exactly where I will do that. You are welcome to follow me on Twitter https://twitter.com/CoachTcom and/or Facebook https://www.facebook.com/coachtcom. Those of you that I follow on Twitter, please tag me in any and all tweets you make relating to TN prep sports while I am gone. Thanks! There are a few days that we will be on trains, or local trams, or just out seeing the sights. I will be using a portable, personal wifi and may update from just about anywhere so check in occasionally. May 16, 2014 Update: Grandfatherhood took on another member as Elle Lorren Thompson entered the world at 7-9, 20 inches at 3:14 AM on Friday, May 16th, 2014. This was the first birth of a grandchild that I was able to attend and it was great. We watched two young people truly grow up this morning and not just by becoming parents. The mature way they both handled the rigors of childbirth while smiling and laughing like two kids in a candy store was very satisfying to Elaine Thompson and me. As all parents know, their work has just begun. But, as long as they remember the feelings of today, they can handle whatever comes their way. Congratulations to Anna Shelton Thompson and Mark Thompson on becoming first time parents...just remember to ask Granna and T for help when you need it. April 9, 2013 Update: CoachT is home. Elaine and I had an awesome, awesome trip to Europe. Best ever by far! But, so glad to be home. London was as great as I remembered it to be. Two great days there. Paris- I never really cared for it before but this time I hated to leave. It was perfect. Carcassonne- awesome place, beautiful, great history. And, of course, Germany which we love with family that we love. It couldn't have been a better trip. Already planning the sequel. If you would like to see our pictures thus far, friend me on FaceBook at https://www.facebook.com/CoachT then go to https://www.facebook.com/CoachT/photos_albums. March 30, 2013 Update: Elaine and I are in Karlsruhe now. March 18, 2013 Update: Elaine and I leave for Europe today, our 36th Anniversary- two days in London, the Eurostar to Paris for four days, a day trip to Normandy, a train ride to Carcassone for five days, and then on to Germany by train. We will be updating the site every day from the UK, France and then Germany! There is a five hour time difference to London, 6 to Paris, so there may be a longer delay in making updates than usual but we will make it work. February 4, 2013 Update: Elaine and I have bought our plane tickets and are going to London, Paris, the D-Day Beaches, southern France, and Germany in late March and April. We will be meeting the Renz family in south France for a week and then going to their home in Germany. 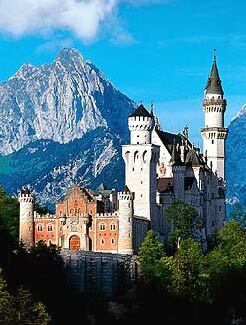 September 9, 2012 Update: My wife and I will be arriving in Germany on Wednesday and then traveling to Neuschwanstein Castle on Thursday for my 60th birthday. Can't wait to see Brynn, Philipp, Isabella, and Alexander. I will be updating the site on Friday night from the German Alps. We'll see how that goes. Any help from fans would be greatly appreciated. I don't like being away from the computer at any time during football season but recent events have taught me that I better do these things while I still can. On all days except Friday it is actually easier to cover football from Germany than from my house. 7 hour time difference means I can update the site at 1PM German time versus 6AM TN time. June 4, 2012 Update: Well, another visit is about to end. Mark was married on Saturday to Anna Shelton which put a very fitting end to a great visit. Hopefully we will be heading to Germany in September. April 23, 2012 Update: May 8, 2012 the Renz family will be returning to the Thompson house. Excitement is starting to build but I have a lot of work to do first. Recovering well, but slowly, from a bout with viral meningitis and the shingles but the goal of knowing they are coming, and getting to hold Alexander for the first time and Isabella once again, is a huge incentive. December 26,2011 Update: On November 30, 2011 our second grandchild, Alexander Richard Renz, was born! He is a real cutie! Elaine went over on the 25th of November and came back on Dec 21 but we get to see them almost every day on Skype. They will be here in May, we hope. July 7th Update: Isabella, Brynn, and Philipp met us in St. Augustine for a week on the beach and Brynn and Isabella returned home with us. Tomorrow they will return to Karlsruhe, Germany. In early August Katie will be flying there for three weeks and Brynn is expecting her second child on December 13th!!! May 6th Update: Isabella, Brynn, and Philipp will be meeting us in St. Augustine on June 19th for a week on the beach. Elaine has a niece that is getting married that week so we are all going to meet there. Brynn and Isabella will return home with us for another couple of weeks after that. Can't wait! February 7th Update: We got home Thursday night after a long trip home. Never have I been more glad that I went somewhere and never have I been happier to be home. Now the long wait until they visit us in June. January 31, 2011 Update: Elaine and I have been in Germany since January 18th and have three days to go. We are visiting our daughter, Brynn; her husband, Philipp; and our granddaughter, Isabella. We have traveled somewhere almost every day including the spas at Baden-Baden today. Great trip so far but very cold which, of course, it should be in January. January 16, 2011 Update: Leaving in the morning (Monday, January 17th) for an 18-day stay, returning February 3rd. Long trip but can't wait to get started. Will be updating CoachT.com, as always, but this time from Germany where it is actually easier to do so because of the 7-hour time difference. Normal 6AM updates can be done at 1PM Germany time. December 15th Update: On our way to Germany for the third time on January 17th! Planning to go to Paris for three or four days, also, but not making any definite plans based on the weather. September 25, 2010 UPDATE: Well, this visit is over but it was great. They arrived back in Germany this morning at 7AM Germany time. Really didn't want to see this end but, as I always tell my kids because it is what I believe, they are where they are supposed to be at this point in time so I am happy for them. See you in Germany, in January, perhaps. September 19, 2010: Brynn, Philipp, and Isabella arrived from Germany on August 26th for what has been a great visit. Philipp had to return home last week but Brynn and Isabella are staying until Friday, September 24th. Besides staying here at the house enjoying each other's company, they went to Niagara Falls while Philipp was here and Brynn and Isabella went to Chattanooga today to visit a college friend of hers from Russia and to go to the Aquariuim on Monday before returning here. Isabella is at a wonderful age right now (14 months)- walking, talking a little in two languages, laughing, inquisitve, and gives great hugs. Don't want to think about them leaving quite yet. July 1st: The highly-anticipated third American tour of Isabella and her entourage has been scheduled. They will arrive on August 26th and stay until September 24th!! May 31, 2010: Elaine and I visited Germany March 30-April 8th. We get to see Isabella on Skype just about every day so the distance doesn't seem that great. And, Elaine and I have since retired. Not sure when we will get to travel to Germany again but Brynn will probably come here this summer or fall so we will make our plans around that. January 17th, 2010: Brynn, Philipp and Isabella have returned home after a wonderful visit. Isabella got her first tooth on the trip home and has since gotten her second one. She is rolling over now, too. We get to see her every day or two on the webcam which will have to do, for now. Not sure when we will see them again but most likely either in April if Elaine and I decide to fly over on spring break, or in June if we decide to wait until then, and for sure in July when Brynn plans to visit again. December 18th, 2009: The highly-anticipated second American tour of Isabella and her entourage begins Monday night at 6:24 at Nashville International Airport. It's gonna be a really, really good Christmas this year. October 27th, 2009: The return date to the US is set. Brynn, Philipp, and Isabella will be back on December 21 and will be staying until January 8th. We see Isabella almost every day on webcam but nothing like holding her. She should be playing a little by the time they get here. Gonna be fun. September 12, 2009: Haven't updated in awhile. Brynn and Isabella are here. Can't explain to non-grandparents what it feels like. Doesn't matter if she is crying or happy, it all feels good. They have to go home Monday, as I am sure her father is missing them, but I'll deal with that on Monday. August 23, 2009: Isabella is doing well. She got to use her passports for the first time this weekend when Brynn and Philipp took her to Switzerland where they attended a wedding party while Philipp's parents got to watch over Isabella. She then got to meet her great-grandmother on Saturday in Tuttlingen, Germany. Brynn and Isabella will be here for a visit from Sept 3 - Sept 14. August 7, 2009 Update: Elaine is home. I'm sure that leaving Isabella was very hard for her but we are glad to have her home and we will be seeing Brynn and Isabella here Labor Day. July 30, 2009 Update: Brynn and Isabella are doing fine. Elaine is still there but will be coming home a week from today. Be kinda nice to see her again. July 22, 2009 Update: Brynn got to go home from the hospital on Monday and Isabella is doing great. Elaine took another German class today to learn that language where every few words you hear them say "garbage" or "hocker". I always knew, and have witnessed, that grandparents are not sane. Yesterday at Walmart I showed Isabella's picture on my cellphone to everyone I knew, even if I hadn't seen them in 29 years. And, when one of her pictures comes up on my screensaver and I happen to look up, I grin like a complete fool... and don't care. July 15, 2009 Update: It's a Girl!!! Wait, we already knew that. 19 1/2 inches long and 7 lb. 5 oz (I think, metric system) with dark hair and great lungs. I am listening to her on speaker phone now (1:45 AM) waiting for Brynn to get back in her room. Mom and baby are doing great and, of course, she is beautiful!! July 15, 2009 Update: Just got an email from my wife, Elaine, in Germany and I hope she wouldn't mind me sharing it. It says, in part, "Our granddaughter's full name is Isabella Elaine Renz!!!!! I cried." Brynn had never mentioned what the middle name would be. July 13, 2009 Update:Wednesday, July 15th, is the day we have long awaited. Elaine is in Karlsruhe for the blessed event and will stay for three weeks to help with the baby. July 6, 2009 Update: Too many changes going on. Philipp received a promotion at work today and they are staying in Germany. I am happy for them, actually, but was looking forward to them being a little closer to home. Now I will have to spend summers in Germany. July 4, 2009 Update: Brynn is scheduled to have a c-section on July 15 because, just like her mom, Isabella has decided to enter the world backwards. Elaine will be traveling to Germany on the 12th and staying until the first week of August while I have decided I can best help by staying out of the way. Except for the webcam visits I will have to wait until Labor Day to see the granddaughter but, since Brynn and Philipp are then moving to Albany, NY, I will get to see her occasionally. Of course, never often enough! Katie and Mark had successful spring semesters at ETSU and wll be returning there in the fall. Katie has also been taking a couple of classes this summer at Columbia State. At the age of 56, after watching many friends become grandfathers up to a decade or more ago, it is my turn! Our daughter, Brynn, is expecting with the due date some time in mid to late July. Elaine and I are thrilled for her and her husband, Philipp, and they will be very caring, very loving parents. In turn, we are excited that there will be a grandchild to spoil and fully intend to do our part. The birth will take place in Karlsruhe, Germany which is where they currently live. Elaine is going to France and Spain in late May and early June with a group of students from Lawrence County High and then she will travel on her own from Spain to Germany to visit Brynn for a week or so. Elaine will go back to Germany to spend a few weeks before and after the baby is born. I, on the other hand, will most likely stay home. It will be much easier for all involved if Elaine goes by herself and stays as long as she can. School will be starting here before she returns so it looks like I will be warming up the webcam. I admit it will be hard to stay here once the moment starts getting close. Brynn can't work full-time for two years, by German law, and the public frowns on you if you don't take three years off. She gets paid, though, as an encouragement for Germans to have children. That may be one of the reasons their tax rate is 42%, also. She is ready to be in school and will be very successful. She also has big brother Mark up at ETSU with her and the two of them together will enjoy the coming months and years. I envy their youth and potential and the good times they are going to be having. Once again, everyone in the family is where they are supposed to be at this moment in time.